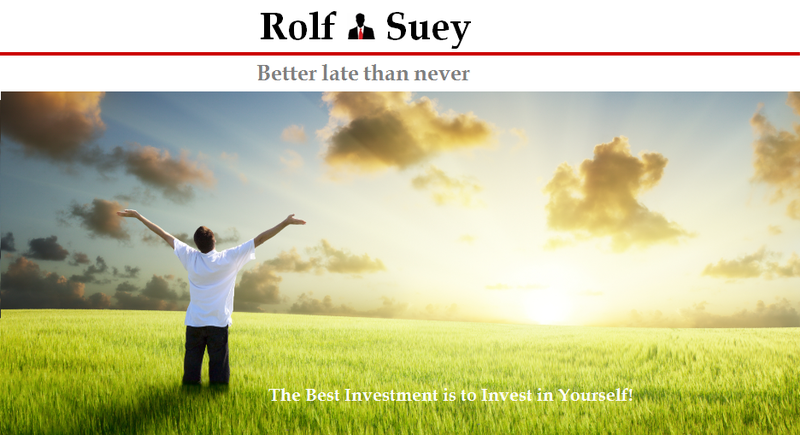 Rolf Suey - Better Late Than Never: Relationships – What It Means to You Financially? Last week, the country mourned the passing away of our founding PM Mr. Lee Kuan Yew (LKY). While saddened by the demise, it is encouraging to witness millions of Singaporeans TOGETHER to pay their last tributes to Mr. Lee. Aside from Singaporeans stand UNITED, a significant scene I noticed is LKY and Singapore’s wonderful relationships with the rest of the world. 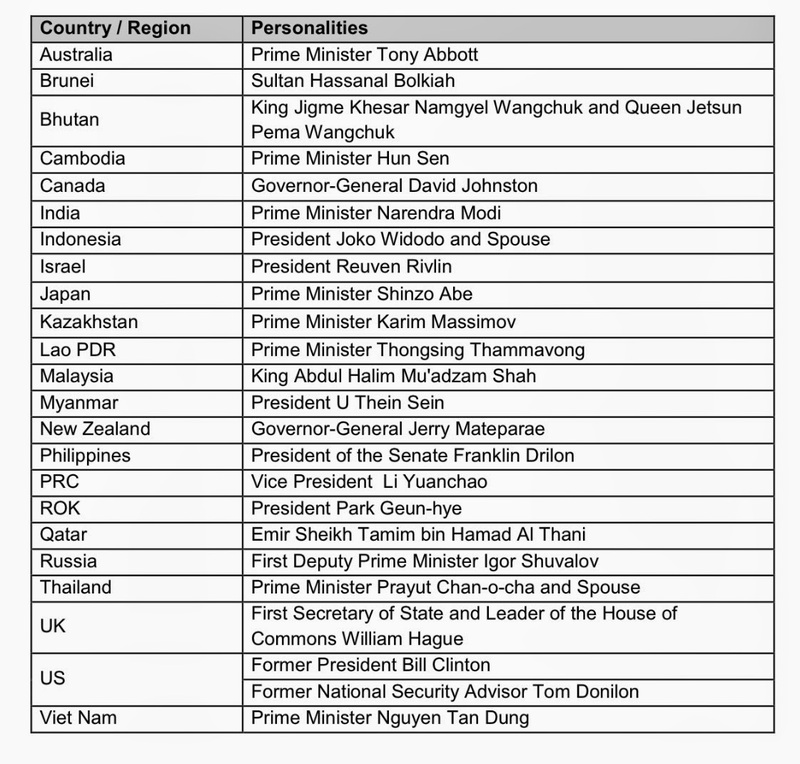 Below is the list of leaders / dignities worldwide attending the state funeral. Impressive isn’t it? It just show you how well LKY and Singapore is connected globally. 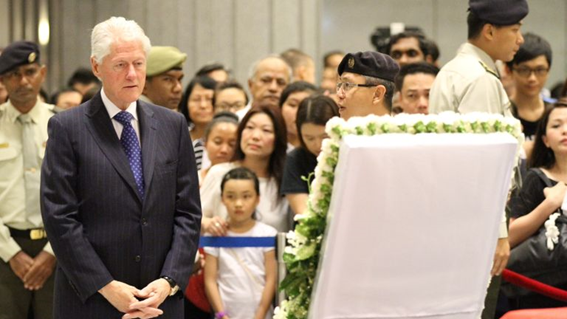 Former US President Bill Clinton paying respects to Mr Lee Kuan Yew at Parliament House on Saturday, Mar 28 (Photo: Xabryna Kek). On the same day of Mr. Lee’s passing away, Lee Ka-Shing, the Hong Kong magnate and Asia richest man, was seen at the wake with his two sons. Yes…, on the same day! Jack Ma, China internet tycoon also attended the wake. Yes….even LKY’s long-time opposition rival Mr. Chiam See Tong (pic below) attended the wake paying his respect and tribute, in spite of the feebly physique. 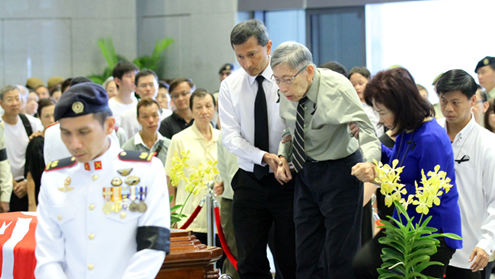 Mr. Chiam was also seen present at the sending off funeral braving the rain in a wheelchair. Both leaders have different ideologies and debate intensively over the years, but both Mr. Lee and Mr. Chiam are true great leaders who fight with dignities, and with their hearts only for one thing in common - SINGAPOREANS. My utmost respect to both leaders! Do these world leaders, so busy and so far away, really need to be present within such short notice? Yes, one may argue it is because Lee Kuan Yew’s son is still the Prime Minister of Singapore, therefore must “Give Face to Singapore”. Haha… If you really think that “Face is for others to Give”, then think again. While Singapore boast a rich GDP today, our survival is dependent on other countries more than others is dependent on us. Singapore is just a little RED Dot, so vulnerable and dependent on many other countries for survival. Not the other way round. LKY or Singapore’s relationships building with rest of world encompasses frequent visits to countries globally. Without any doubts, I will have think that his excellent relationships building, will prominently include crucial factors, such as Integrity, Sincerity, Honesty & Trust, Mutual Respect, Mindfulness and Tactfulness, Open communication, to be a Giver first, and of course Win-Win Strategies, and many more. What does relationships got to do with Money? You may asked! For an employee to progress in his career ladder, not only work capability is important. Relationships with superiors and fellow colleagues are even more important. For those who worked in a big organisation or even familiar with within SAF, you will see that this is absolutely true. So many times, I had seen friends or colleagues who are good in their jobs but never promoted or progress so slowly in work. They are experienced, technically capable, so systematic, so high work rate, so confident about themselves, and so EAGER to climb and earn more! Nevertheless, they just cannot connect with people. Often, these people are destine to be managers of themselves and not others! Therefore it’s either they are never able to climb to the top management, or they climbed really slowly. Of course, this is perfectly ok, if you love what you do, and prefer to manage yourself and be contended and down to earth. In building a business, it is the same. If you think simply by having a good brain, good product and good plan, you can bring your business very far, then you are naive! Ultimately, you require superb EQ to establish relationships with other business associates, collaborate, joint-venture, expand network of contacts to bring the business to the next level. I had seen PHD friends who are entrepreneurs. They are smart, with great ideas, but perhaps need more effort to polish their “people’s people” skills. Of course, they are unaware and still struggle in their business not knowing the reasons why, after tens of years of entreprenuerships. It then goes without questions how important relationships are for Singapore, consider our minion origin. Of course, I am not saying that relationships alone win battles. It is a combination of other important attributes, such as integrity, sincerity, diligence, visions, analytical minds, pragmatism etc and then the assembly of a strong team. Relationship building is also one of the most important attributes, perhaps lacking quite a bit in today’s generation. This is probably made worst by the internet, which most prefer to hide behind a computer rather than to have face-to-face encounters. Below are some questions you may want to ask yourself to see how good you are in establishing relationships with people. Do you only approach people when you have an agenda? Money making maybe? Even with an agenda, do you give more than what you will get? Is your agenda win-win, or only benefit you. Without any agenda, do you still call and meet up the person on the other side. Without any benefits, will you ever help? How often do you meet your friends? Or do you have any friends aside from your family or friends in the cyberspace? How often do you meet and interact with different people from different backgrounds and different nationalities? Are you able to handle them effectively? It is so easy to speak your mind on a computer or blog, but can you also do it comfortably with people or in front of a crowd? If you can speak well, do you only speak well with people of your subordinates, or younger than you. Or you also speak well to people of a “higher” level than you? It is so easy to voice your opinions on a forum, but do you dare to pose the questions in a seminar of hundreds? Can you speak as well as you write? More importantly, do people like to talk to you? Or are you doing all the talking, all the time? Even if you can speak and convey your messages well, are you a person of charisma who is also likeable by people? Do you give and earn respect, mutually. Do you incorporate tact, mindfulness in your way of communication and yet able to confidently and articulately convey your message across? Do you listen and accept other’s ideas, or only think that you are more superior both by age and experiences? So did you managed to pay last respect to LKY in the Parliament House? I had a good sun tan as im involved in the crowd control everyday over there. I was with a 3 month old, hence will be difficult to go parliament house. Work is another barrier. Instead our whole family goes to community site to pay tribute including the 3 month old. Afterall the little action plus the heart do counts! Hope you enjoy the Free tanning! Thanks on behalf of Singaporeans. Good list of questions there to ponder. To be fair, I think there's a little bit of the united nation formality there to sort of "give face" to the nation's greatest loss but there's no doubt the amount of respect that this man has over the world. It lays side by side with the utmost respect the world has for world leaders like gandhi and mandela. The world lost a great leader and is rightfully so during the mourning week it is so evidently painful. Thanks. Questions are NOT good when there are no answers! So I fail in this... Haha. I agree on some attendees for united nation formality, but you have to look more closely to the names of attendees. LKY is afterall our ex ex PM. Many are just not necessary to be here, especially for those in the western cultures. Hmm... why did Clinton attend? He is no longer the president and USA is not very near. Why did Xi JinPing need to announce China close relationships with Singapore during Boao forum. Why did Bhutan King need to attend. Why did Chiam See Tong need to do that even on wheelchair. Not because of formalities but because Chiam is a person who value relationships. Chinese says 讲情讲义. Your points on building relationships are so very true. Building relationships is as difficult as building a portfolio! Maybe more difficult since it requires non-tangible aspects of life. 披着羊皮的狼! Haha... their true wolve's' tails will show eventually. But sadly, many of these wolves in office are still surviving and enjoying their lives. So while we cannot be wolve, we need to learn skills to counter them and not be their prey.